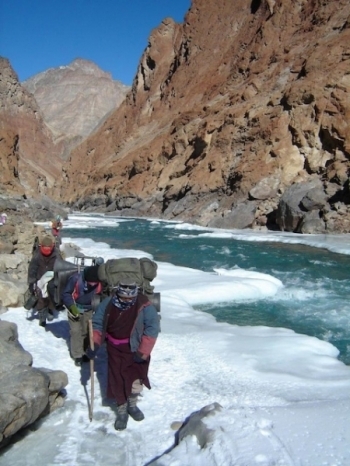 Chadar Trek (Frozen River Trek) is an unusual yet thrilling expedition of walking on frozen river. The Zanskar River freezes in winter, enabling walking on the thick ice sheet along the area that is inaccessible in summer. Chadar Trek allows us to penetrate this isolation and also to examine some of the picturesque remote villages along the Zanskar River in the midst of winter and thus catch a glimpse of the lifecycle during this unique time of the year. The traditional name of the trek "Chadar " means the frozen sheet, which served as the lifeline for the people of Zanskar for centuries as they had to go back and forth to the outside world, when the passes were inaccessible due to heavy snowfall. Now the route is also famous as winter trekking as walking on Frozen Zanskar River is an ultimate experience for adventure lover. Most of the trek is done on the ice (Chaddar) but at some places we must climb icy rocks or trails which can be pretty challenging. In normal course of journey along the villages, we follow the trail traditionally used by the people of Zanskar for ages. Any person thinking of joining this unique adventurous trek must be fully prepared to adapt to the tough walking and inhospitable camping conditions at times. The total distance of this tour is approximately 210 Km and will be covered with average distance of 15 to 17 km a day. The temperature remains minus 15 to 20 during the day time and - 25 to - 35 during the night. Most of the overnight halts will be done in the caves and in Villages we may sleep in the houses provided by the local people devoid of many basic amenities of modern life. However the porters and the kitchen team will be totally Zanskaris, who are naturally trained to work in any harsh weather conditions, so you can really count on them for the best service possible. We have two options for Chadar (frozen river) trek, the longer route- up to Padum, the main town of valley and the shorter one is up to Lingshed village.